by which my people consume. by which my people play. by which my people strum. love PE, music, dance and drama. I’m pretty good at rugby. if you can play rugby? he just couldn’t pay the bucks. to my skin tone and my colour. and do I have to mention… the GC? than putting our own people to shame? for a few seconds of fame? for we are all the same. in search of a J-O-B? than the eye can see? mountains from point A to point B? than assets to the 1st XV? than gamblers at a pokie machine? than [jandals and golden teeth?]? than our gamblers at the T.A.B.? a master’s, or a PhD? Brown brother – look at me! you are more than capable. me to tell you so. the marrow of your bones. but a change in mindset. Thanks to Michael for transcribing. hope he’ll come here and fill in the gaps in my (ie his) script. Please watch this extraordinary speech by Samoan Niuean New Zealand schoolboy Joshua Iosefo. It’s something everyone interested in race relations should see. As a professional speaker and former Toastmaster, I’ve seen a lot of speeches in my time, right up to world championship level. But few have touched me like this poetic ‘spoken word piece’. TV3’s John Campbell obviously felt the same way, and featured a re-shot, slickly edited, but more clinical version of it on his show. I prefer this raw version. It’s Joshua giving his speech live to an assembly of his Mt Roskill Grammar School peers. Most heartening to me is the standing ovation he well and truly earns from his ‘brown brothers’. Our Pacific citizens seem to have a more positive, law-abiding attitude than Maori. Pasifika people are 7% of New Zealanders and commit 11% of the crime — not much more than their share of the population. Maori, meanwhile, despite being massively more indulged by the state than their Polynesian cousins, make up 15% of the population and commit 49% of the crime. Could Joshua’s attitude — and the wildly popular reception to his message — explain the difference? Thanks to James Clark for painting such a glowing picture of ‘Brown Brother’ that I just had to interrupt my day and watch it. For those who requested the words, I’ve posted them here. What if the Hauhaus had won? The rebels breached the Treaty when they waged war against the Queen. They’d been warned they’d lose their land if they did so. Much of that land was returned — or compensation paid (unnecessarily in many cases). If the Maori had won, they would have confiscated a lot more than land! Four hundred anti-pakeha Maoris formally surrendered at the junction of the Waiau and Wairoa rivers in March or April 1866. Samuel Deighton took the oath of allegiance. That last quote came from Thomas Lambert’s The Story of Old Wairoa and the East Coast District, North Island, New Zealand, page 591. This cutting comes from Mike Butler’s book The First Colonist about the life of his great-grandfather, Samuel Deighton. Deighton was the first colonist to step ashore at the first settlement, Petone. For the next half-century he was involved in many defining events of our early history, including fighting the Hauhaus on the East Coast. In a letter he relates this warning by loyal Maori chief Pitera Kopu to 400 defeated rebels at Te Kopane, near Wairoa, in 1866. Kopu makes the remarkable point that “the tikanga of the Pakeha was one of aroha (mercy)”. He was therefore restrained from imposing the more traditional Maori punishments of enslavement, death and devourment. I’ll soon be submitting my question for a ‘one vote/fix all’ referendum. This will demand a Colourblind State, where all government funding and representation must be based on need, not race. Meanwhile, my own search for funding for the Treatygate public education campaign goes on. Thanks for anything you can spare — and a big thank you to those who’ve already contributed. For a campaign designed to build over two years, the first week’s coverage of the fundraising phase has been pleasing. Mentioned in despatches by Bryce Edwards in the Herald. Laura McQuillan for TV3 online. Tini Molyneux on Te Karere. Vaughan/NBR online again — this time an exclusive for subscribers only. Evan Hardin in the Southland Times. Vaughan Elder in the Otago Daily Times. Chris Trotter in the Dominion Post. Trotter in various other papers including the Taranaki Daily News. Tahu Potiki in the Christchurch Press. Simon Dey in the Sunday Star-Times. Edwards in the Herald in despatches again. With Julian Wilcox, Joris de Bres and Ella Henry on Maori TV’s Native Affairs. Rosemary McLeod in today’s Dominion Post. The left-wing blogs are doing their bit by viciously attacking me in an attempt to distract from my message. The neutrals tell me it just makes them more curious. Abuse from the Grievers is always a sure sign that they’re rattled, and that my ‘bunker-busters’ are cutting through. 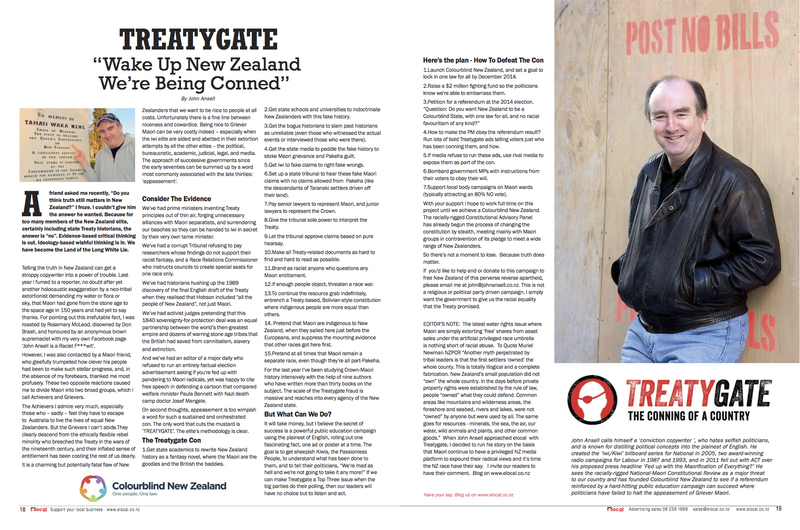 One lovely chap called Nick Dale even describes me as “New Zealand’s Madman”. Well, you can’t win ’em all. Meanwhile funders great and small have been building up quite a fighting fund. We need lots more, but if one of these kind donors is you, I thank you for what you’re doing for our country. I’ve also found two excellent trustees to provide managerial oversight, so can now register the trust. Thanks to both of you, who I’ll be proud to name if you give me permission. To donate to my campaign to expose the Treatygate fraud and make New Zealand a Colourblind State free of all racial favouritism by 2014, click here. If you’re wondering why so many of my posts are about media coverage, that’s because I’m still very much in the fundraising stage of the Treatygate/Colourblind State campaign. I want to prove to potential funders that the snowball that elocal magazine set in motion with its Treatygate story can build into an avalanche capable of terrifying the government into obeying the will of the people. So the campaign proper has yet to begin. But here’s a taste of the sort of historical detail I’ll be revealing. It’s from a letter written by Governor Sir George Grey to the rebel Waikato chiefs in 1863. There’s masses more where this came from. The Dominion Post has published this excellent letter from author and journalist Mike Butler. Mike is one of a team of researchers who’ve been advising me on Treaty issues for the past year. His file of all Treaty settlements since 1989 on Muriel Newman’s NZCPR site is the most comprehensive I’ve seen. Treaty Negotiations Minister Chris Finlayson calls Mr Ansell’s campaign “nuts”, but in his rush to get through a pile of settlements, he seems unaware that major claims were settled before 1960. With 2034 claims lodged by 2009 but only 11 claims brought to Parliament in 1920, it’s clear that now money is the motivator. 2012 — Ngai Tahu Not So Full and Final 17% Top-up. Thanks Mike for all your great work and support. 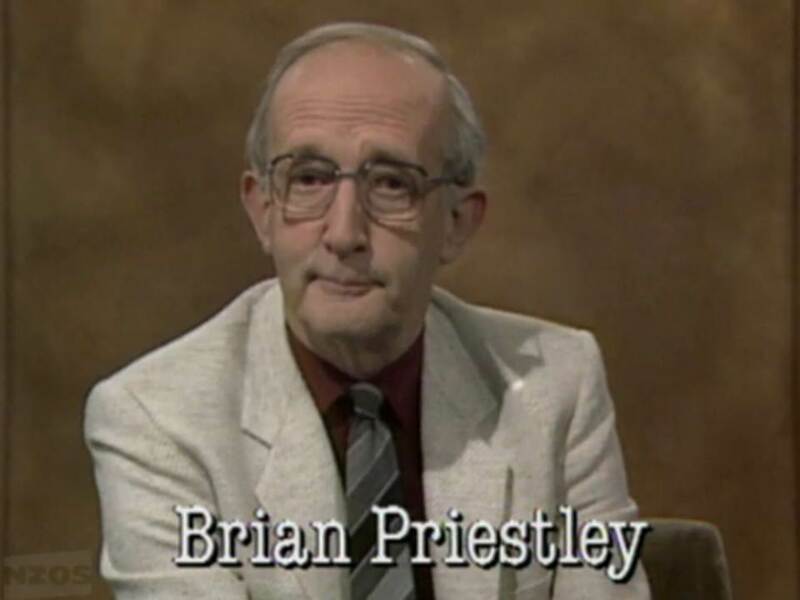 Those of you who remember The Fourth Estate TV show from the 1980s will remember legendary media critic Brian Priestley MBE as a relentless seeker of truth and balance. “Years ago I attended several sessions while advising the Ngai Tahu on public relations for their claims. It would be hard to imagine any public body less well organised to get at the truth. There was no cross examination. Witnesses were treating with sympathetic deference. The people putting the Crown’s side of things seemed equally anxious not to offend. In three months I don’t think I was asked a single intelligent, awkward question. Thanks to Colin Rawle for this quote from a story headed Ngai Tahu claim: too little critical analysis in Wellington’s Evening Post of April 3, 1998. ‘Treatygate could have huge ramifications’ says commentator Chris Trotter in yesterday’s Dominion Post, Otago Daily Times, Waikato Times, Taranaki Daily News, Timaru Herald, and Greymouth Star. 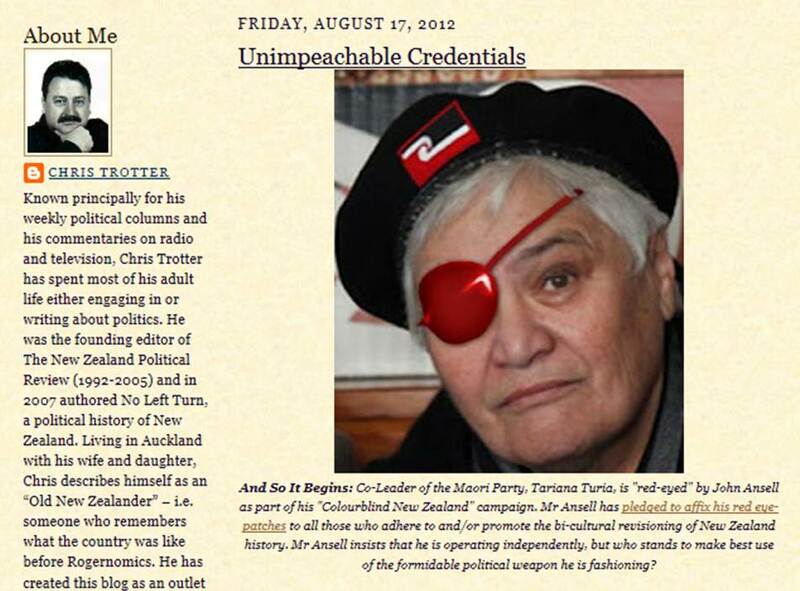 And on his own blog, where he helpfully includes my eye-patched photo of Che Guevara impersonator and Exaggerator-General Tariana Turia. Those who read Chris regularly will know that he can be quite schizophrenic in his views. With Don Brash, he could praise him to the heavens one week, and lash him the next. But on racial favouritism, I’ve found him to be consistently opposed. He supported the goals of the Coastal Coalition in fighting to keep our coastline in Crown ownership. He has always treated me respectfully in his columns, despite occasionally damning me as dangerous. I was impressed that he once had the courage to stand up for ‘Mr Ansell’ on the blog of particularly vicious lefty Scott Hamilton, when I dared to suggest that Maori were now more a religion than a race. I thought this current article was fair, except for the ending. I have written to assure Chris that I will not be accepting any money from the current incarnation of the National Party. I do agree with Chris that it’s possible the Constitutional Review will assist National — if its biased Constitutional Advisory Panel is left to proceed unchecked. Unless they are forced to obey their stated aim, they are bound to produce a report claiming that a majority of New Zealanders want a Treaty-based written Constitution, and to retain the Maori seats. That’ because they intend to break their founding promise and not go anywhere near the majority of New Zealanders. A lady from their secretariat (located in the Justice Ministry, of all places) told me that they had no plans to hold any public meetings because “some people might cause trouble”. My spies inform me that the Panel has already conducted dozens of clandestine meetings with groups that share their separatist agenda, and are studiously ignoring those who don’t. I asked to speak to co-chair Dr John Burrows — the only one I thought we, the people, might be able to trust — and he said he would try to get back to me in a couple of weeks (note the ‘try’). That was many weeks ago. He doesn’t appear to be trying very hard. I will therefore soon be exposing him as a Treatygater. Chris doesn’t agree with me, but I think the currently anonymous leader of the Labour Party might consider taking advantage of the groundswell of support that will be engendered by the Treatygate/Colourblind State campaign. Labour since the days of the dangerous Geoffrey Palmer has been the lesser of two evils in the appeasement of Griever Maori. Their Foreshore and Seabed Act was far less damaging to this country than National’s Marine and Coastal Areas Act will be. Helen Clark rightly refused to sign the United Nations Declaration on the Rights of Indigenous People. John Key, on the other hand, was happy to appease his separatist mate Pita Sharples with an airfare to New York, so he could sign the DRIP before we found out. The apparition that is David Shearer could actually become visible and popular if he were to stand with 80% of New Zealanders against racial favouritism. It would differentiate him from Key over an issue that is going to snowball into an avalanche come the next election. It would be one issue where the public would be solidly behind him. Chris Trotter thinks he should, but won’t, citing Labour’s hatcheting of Phil Goff after his ‘Nationhood’ speech. But that was back when race relations was not the hot potato issue that it soon will be again. If Shearer did stand with the 80% (the number who consistently vote against Maori wards), would Key then be forced to flipflop to match him? Might John Key ditch the Maori separatists and promote a Colourblind State, even before my referendum at the 2014 election? Thanks for all the donations in recent days. Even the smallest amount is greatly appreciated. It has not been an easy year working full-time on this unpaid, but I am greatly encouraged by the level of support now. Particularly heartwarming have been the many emails and blog comments from Achiever Maori. You guys ‘get’ that I want the best for all New Zealanders, very much including Maori, and I appreciate that more than you know. Rod Vaughan tells me his article on Treatygate has produced the most feedback of any story in the three year history of NBR online. He will soon be doing a follow-up story that will reveal details of a Maori friend’s similar campaign against the Grievers, and my approach to a leading lawyer about mounting a court challenge to the legitimacy and shonky dealings of the Waitangi Tribunal. 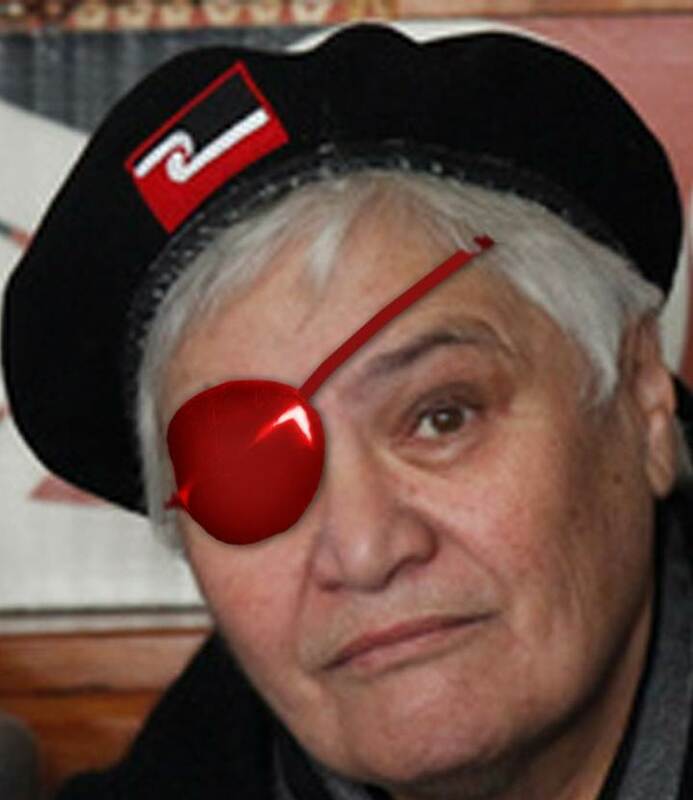 The eye patch in this logo represents the pro-Maori-separatist bias of the New Zealand political, bureaucratic, academic, judicial, legal, media and iwi elites. I intend to put red eye patches on all the con artists from these various elites who have sullied the good names of your forebears, and robbed you and your children of your right to understand your true history. If we don’t do something soon, your one-eyed appeaser government will soon be saddling us all with a written Constitution, based around the bogus English version of the Treaty of Waitangi. When this happens, New Zealand as you know it will be over. If you lack the required millilitre of Maori blood that entitles you to state favours, you will officially be a second-class citizen. You may be horrified to learn that this process is already well underway. The racially-rigged Constitutional Advisory Panel is right now conducting clandestine meetings with groups likely to support their agenda. And it’s pointedly refusing to have anything to do with that great Griever occupational hazard, the New Zealand public. Evidently, they will not be holding public meetings because “some people might cause trouble”. This one certainly intends to. Our fathers and their fathers (including the fine men of the Maori battalion) fought and died for this country. Their fathers before them built this modern nation from scratch — with little help from the ancestors of the ungrateful separatists who now demand the fruits of that pioneering labour. 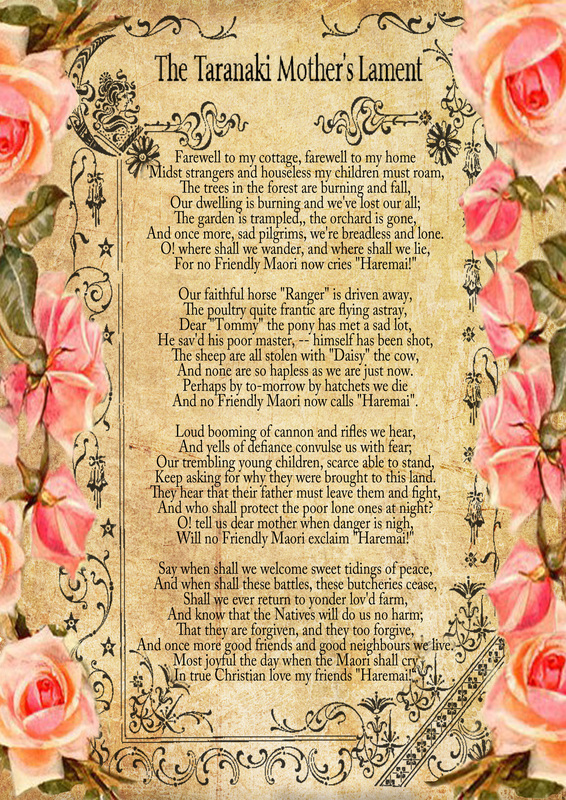 Our mothers and their mothers and grandmothers suffered unspeakable agonies in the cause of building New Zealand and keeping it free. Have we, their descendants, become so spineless that we’re prepared to surrender that country, step by sneaky step, to a small clique of inter-related, separatist moneygrubbers — for fear of being called a name? Will the protestors who marched against apartheid in a foreign land stand idly by as the separatist creed takes root in their own? I challenge all media to poll their readers on whether they want New Zealand to be a colourblind state, free of all forms of racial favouritism. If they don’t, then fine. But if they do, then woe betide those media chiefs (I’m talking to you, Bernadette Courtney of the Dominion Post) who ignore the voices of those who keep them in business. 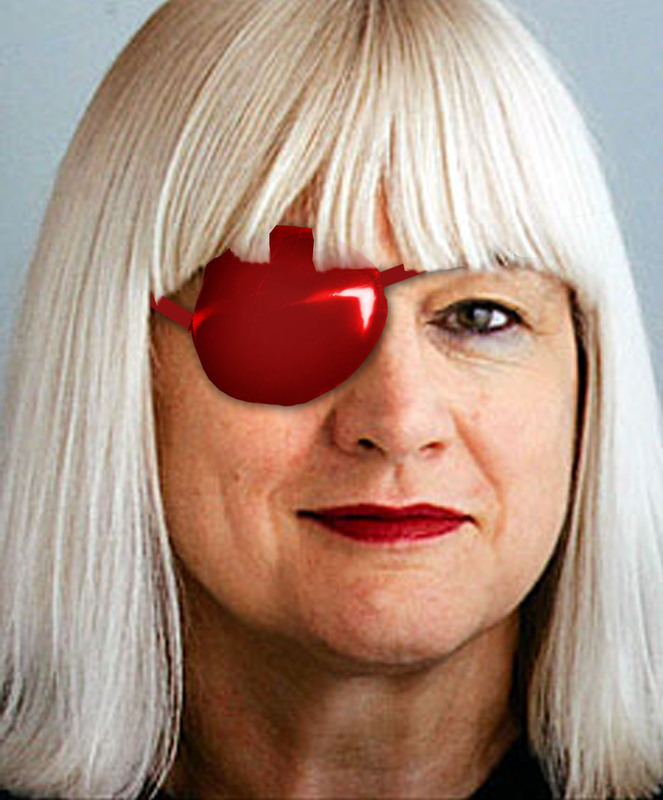 You will soon find yourselves paraded in other media wearing a red eye patch to signify your bias and your membership of the Treatygate brigade. And woe betide our parliamentary dictator Key and his chamber of Chamberlains if he does not reactivate the democracy that he and his predecessors have so shamelessly suspended. It is time our representatives got the message that the game’s up and they must start obeying the will of the people. Stand up and prove to us all that Achiever Maori (honest, law-abiding Maori who are quietly and proudly getting ahead under their own steam) outnumber Griever Maori (the motley descendants of the minority rebel chiefs of the 1860s who knowingly breached the Treaty and were punished accordingly) — professional Grievers who have twisted the Treaty out of shape for their own personal gain. Prove that and the mana of the Mana and Maori Parties will evaporate. Prove that and the reputation of Maori among your fellow New Zealanders will soar from the basement in which it now resides — just as it soared in the days of the Maori Battalion. And that, I hope, will be a major by-product of the Treatygate/Colourblind State campaign. This is not about race. It’s about attitude. It’s about shaking off the selfish tribalism that has afflicted all races, mine very much included. Generations of politicians have managed New Zealand poorly. We’re not a rich country any more. If we’re going to stop the slide, the only way is to pull together, not apart. This article is now running in elocal magazine, thanks to one of our country’s few courageous media owners, Mykeljon Winckel. It explains the double-pronged campaign I’m planning to end the Treaty Grievance Industry. Read it here, or double click the pic. I couldn’t give him the answer he wanted. Because for too many members of the New Zealand elite, certainly including state Treaty historians, the answer is no. Evidence-based critical thinking is out. Ideology-based wishful thinking is in. We have become the Land of the Long White Lie. Telling the truth in New Zealand can get a stroppy copywriter into a power of trouble. Last year I fumed to a reporter, no doubt after yet another holocaustic exaggeration by a neotribal extortionist demanding my water or flora or sky, that Maori had gone from the Stone Age to the Space Age in 150 years and had yet to say thanks. For pointing out this irrefutable fact, I was roasted by Rosemary McLeod, disowned by Don Brash, and honoured by an anonymous brown supremacist with my very own Facebook page ‘John Ansell is a Racist F***wit’. However, I was also contacted by a Maori friend, who gleefully trumpeted how clever his people had been to make such stellar progress, and, in the absence of my forebears, thanked me most profusely. These two opposite reactions caused me to divide Maori into two broad groups, which I call Achievers and Grievers. The Achievers I admire very much, especially those who – sadly – feel they have to escape to Australia to live the lives of equal New Zealanders. But the Grievers I can’t abide. They clearly descend from the ethically-flexible rebel minority who breached the Treaty in the wars of the nineteenth century, and their inflated sense of entitlement has been costing the rest of us dearly. It is a charming but potentially fatal flaw of New Zealanders that we want to be nice to people at all costs. Unfortunately there is a fine line between niceness and cowardice. 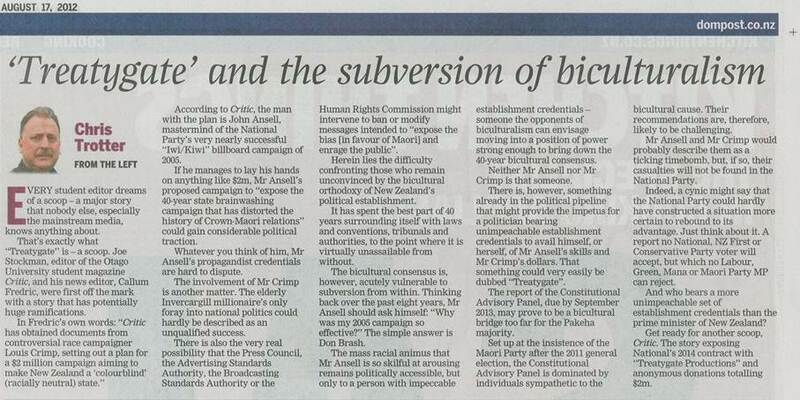 Being nice to Griever Maori can be very costly indeed – especially when the iwi elite are aided and abetted in their extortion attempts by all the other elites– the political, bureaucratic, academic, judicial, legal, and media. The approach of successive governments since the early seventies can be summed up by a word most commonly associated with the late thirties: appeasement. We’ve had prime ministers inventing Treaty principles out of thin air, forging unnecessary alliances with Maori separatists, and surrendering our beaches so they can be handed to iwi in secret by their very own tame minister. We’ve had a corrupt Waitangi Tribunal refusing to pay researchers whose findings do not support their racist fantasy, and a Race Relations Commissioner who instructs councils to create special seats for one race only. We’ve had historians hushing up the 1989 discovery of the final English draft of the Treaty when they realised that Hobson included “all the people of New Zealand”, not just Maori. We’ve had activist judges pretending that this 1840 sovereignty-for-protection deal was an equal partnership between the world’s then-greatest empire and dozens of warring stone age tribes that the British had saved from cannibalism, slavery and extinction. And we’ve had an editor of a major daily who refused to run an entirely factual election ad asking if you’re fed up with pandering to Maori radicals, yet was happy to cite free speech in defending a cartoon that compared welfare minister Paula Bennett with Nazi death camp doctor Josef Mengele. On second thoughts, appeasement is too wimpish a word for such a sustained and orchestrated con. The only word that cuts the mustard is TREATYGATE. Get state academics to rewrite New Zealand history as a fantasy novel, where the Maoris are the goodies and the British the baddies. Get state schools and universities to indoctrinate New Zealanders with this fake history. Get the bogus historians to slam past historians as unreliable (even those who witnessed the actual events or interviewed those who were there). Get the state media to peddle the fake history to stoke Maori grievance and Pakeha guilt. Get iwi to fake claims to right fake wrongs. Set up a state tribunal to hear these fake Maori claims. Pay senior lawyers to represent Maori, and junior lawyers to represent the Crown. Give the tribunal sole power to interpret the Treaty. Let the tribunal approve claims based on pure hearsay. Make all Treaty-related documents as hard to find, and hard to read, as possible. 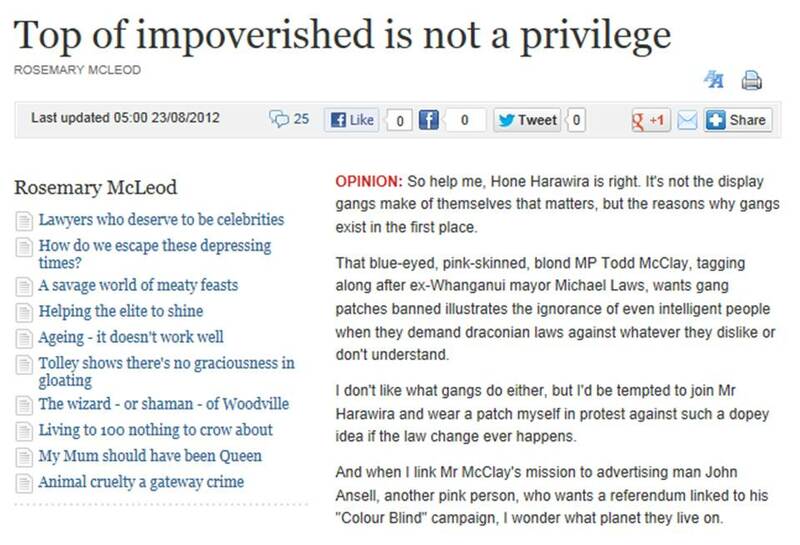 Brand as ‘racist’ anyone who questions any Maori entitlement. If enough people object, threaten a race war. To continue the resource grab indefinitely, entrench a Treaty-based, Bolivian-style constitution where indigenous people are more equal than others. Pretend that Maori are indigenous to New Zealand, when they sailed here just before the Europeans, and suppress the mounting evidence that other races got here first. Pretend at all times that Maori remain a separate race, even though they’re all now part-Pakeha. For the last year I’ve been studying Crown-Maori history intensively with the help of nine authors who have written more than thirty books on the subject. The scale of the Treatygate fraud is massive and reaches into every agency of the New Zealand state. It will take money, but I believe the secret of success is a powerful public education campaign using the plainest of English, rolling out one fascinating fact, one ad or poster at a time. If we can make Treatygate a Top Three issue when the big parties do their polling, then our leaders will have no choice but to listen and act. Launch Colourblind New Zealand, and set a goal to lock in one law for all by December 2014. Raise a $2 million fighting fund so the politicians know we’re able to embarrass them. How to make the PM obey the referendum result? Run lots of bold Treatygate ads telling voters just who has been conning them, and how. If media refuse to run these ads, use rival media to expose them as part of the con. Bombard government MPs with instructions from their voters to obey their will. Support local body campaigns on Maori wards (typically attracting an 80% NO vote). With your support I hope to work full-time on this project until New Zealand is a Colourblind State. The racially-rigged Constitutional Advisory Panel has already begun the process of changing the constitution by stealth, meeting mainly with Maori groups in contravention of its pledge to meet a wide range of New Zealanders. So there’s not a moment to lose. If you’d like to help and/or donate to this campaign to free NewZealand from this perverse reverse apartheid, please email me at john@johnansell.co.nz. This is not a religious or political party-driven campaign. I simply want the government to give us the racial equality that the Treaty promised. John Ansell calls himself a ‘conviction copywriter’, who hates selfish politicians, and is known for distilling political concepts into the plainest of English. He sees the racially-rigged National-Maori Constitutional Review as a major threat to our country and has founded Colourblind New Zealand to see if a referendum, reinforced by a hard-hitting public education campaign, can succeed where politicians have failed to halt the appeasement of Griever Maori. The latest water rights issue where Maori are simply extorting ‘free’ shares from asset sales under the artificial privileged race umbrella is nothing short of racial abuse. “Another myth perpetrated by tribal leaders is that the first settlers ‘owned’ the whole country. This is totally illogical and a complete fabrication. “New Zealand’s small population did not ‘own’ the whole country. In the days before private property rights were established by the rule of law, people ‘owned’ what they could defend. “Common areas like mountains and wilderness areas, the foreshore and seabed, rivers and lakes, were not ‘owned’ by anyone but were used by all. 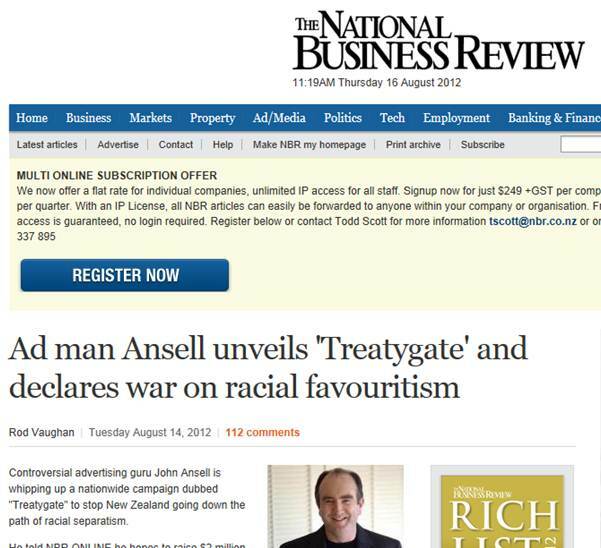 When John Ansell approached elocal with Treatygate, I decided to run his story on the basis that Maori continue to have a privileged NZ media platform to expound their radical views and it’s time the NZ race have their say. I invite our readers to have their comment. Blog on www.elocal.co.nz. My planned ad campaign will not happen unless a whole lot of Kiwis like you are prepared to dig deep to save your country. If a lot of us give a little, and a few give a lot, we can stop the professional grievers and their ‘useful idiot’ appeasers in their tracks. Please give whatever you can afford, and send this link to everyone you know.